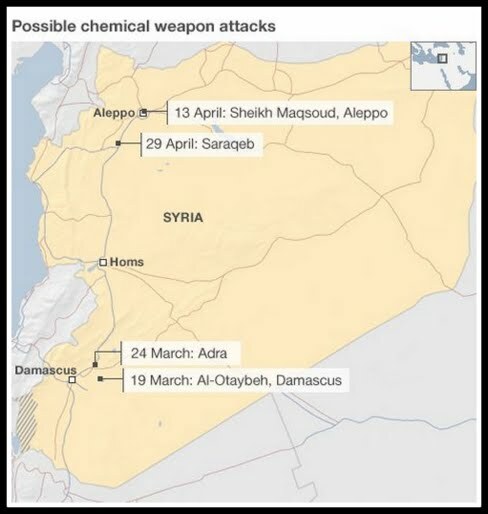 The BBC has been shown evidence that appears to corroborate reports of a chemical attack in the northern Syrian town of Saraqeb last month. Eyewitnesses and victims say government helicopters dropped at least two devices containing poisonous gas on the town. The Syrian government says it did not and will not use chemical weapons. Shortly after midday on 29 April, the town of Saraqeb came under attack from government military positions about five miles (8km) away. A local activist we met filmed as the shells landed. We cannot verify the images but all the footage we gathered from the scene was taken by people we met in the town and appears to have been filmed on the same day from different positions. A helicopter was filmed high above the town. Eyewitnesses say at least two canisters were dropped from it, a claim we cannot verify. What the camera shows is a smoke trail as a device tumbles to the ground. It is claimed that shortly after that, casualties started to arrive at Saraqeb hospital. Eight people were admitted, apparently with similar symptoms; they appear to be vomiting, with breathing problems. The videos show patients with bloodshot eyes and some appear to have constricted pupils. Doctors, eyewitnesses and victims insist this was a chemical attack. There have been similar claims elsewhere in the country but the Syrian government says it did not and will not use such weapons. One activist shouts: "Let the world hear, Obama, Obama, regime troops have crossed all red lines". Mohammed Khatib can be seen groaning on a stretcher. Witnesses say a device had landed in his garden and he had rushed to the scene to help his mother. She can also be seen seriously ill on a stretcher; unconscious and with constricted pupils. Mariam Khatib died later that day. Today Mohammed lives in a tent outside of town. He says he is too afraid to return to the house, too distraught by what happened there. Speaking for the first time he says he still feels weak and exhausted. "It was a horrible, suffocating smell. You couldn't breathe at all. Your body would become really tired." "You'd lose all senses. You'd feel like you were dead. You couldn't even see. I couldn't see anything for three or four days." One device was said to have landed on the outskirts of town. Eyewitnesses describe a box like container, with a hollow concrete casing inside. One video apparently shows parts of this on the ground, surrounded by white powder. In another video a rebel fighter holds a canister said to be hidden inside the devices. Witnesses claim there were two in each container. It is claimed one was recovered from Mariam Khatib's garden. We were taken to the house by one of her nephews. He showed us where the device is said to have landed. A small hole has been smashed into the tiled floor, a pair of disposable surgeon's gloves lie abandoned nearby. The plants around the site appear to have withered and died, showing signs of possible contamination. We have been told that samples from the scene and from the alleged victims have been sent to Britain, France, Turkey and America for testing. "A canister was released from a helicopter and Mariam Khatib came running to the courtyard and called her son, Mohammed, and told him there was a canister with white smoke coming out of it" says Mariam's nephew, Maed Barish. "She immediately became unconscious and fell down, as did Mohammed and his wife. Fighters came to help the family but they were also affected by the smoke." Four patients were taken to a hospital near the border. Dr Jumaa Samadi, who treated them, says they were all given decontamination showers and atropine to treat their symptoms before being sent to a hospital in Turkey. By the time they arrived, Mariam Khatib was dead. 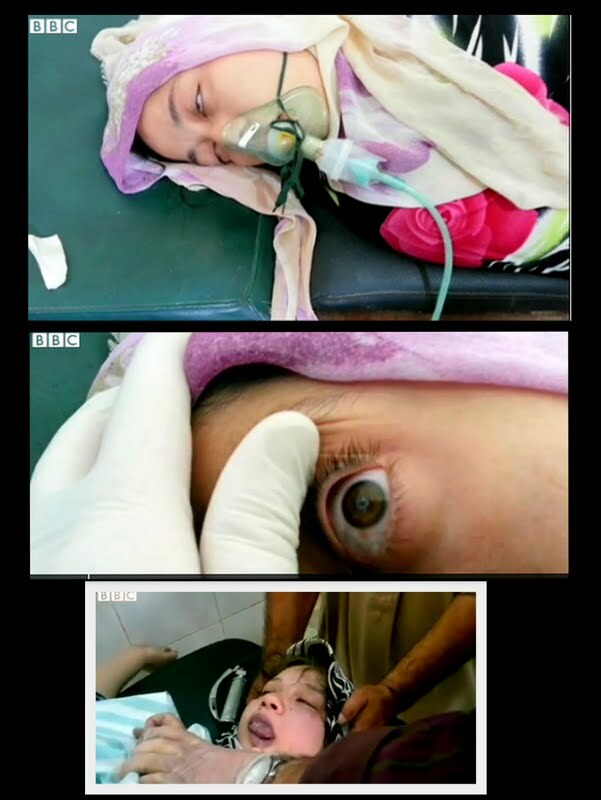 "The symptoms she displayed -- unconsciousness, vomiting, pinpoint pupils -- they all correspond to poison gas exposure," he says. "They often match organophosphate poisoning. It has many derivatives, one of which is Sarin gas." But he says he cannot be sure why Mariam Khatib died until the samples are analyzed. Hamish de Bretton-Gordon is a former commanding officer of the British Army's Chemical Counter Terrorist Regiment who now runs a firm that specializes in the study of chemical weapons. He has not visited the site, nor has he been able to test any of the alleged evidence. But he has studied previous claims and videos and was given full access to all the footage, transcripts and the interviews we gathered to give his assessment. He describes the "virtually identical events" that have taken place in Otaybah, Adra and the Sheikh Massoud district of Aleppo in recent weeks. 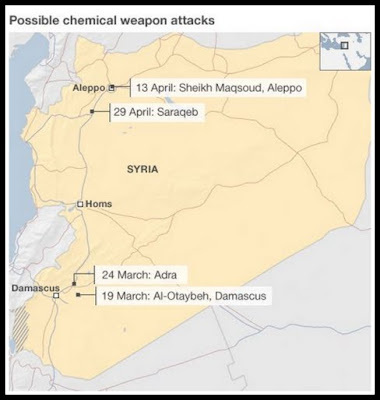 He says that taken together, "[you] start to come to the conclusion that you have strong evidence, albeit incomplete, that sarin or a nerve agent has been used in Syria recently over the last four to five weeks". Mohammed Khatib's sister, who survived, was taken to hospital with a distended tongue and frothing at the mouth. Samples of soil, blood, urine and hair have been taken. They hold the best clue as to what happened in Saraqeb. What it will not do is determine who is responsible and for Mohammed Khatib it is all too late. "I don't believe there'll be any response. People are dying, children becoming orphans and women widows. It's been going on for three years now. There would've been a response already but there's none." The UN says almost 80,000 people have been killed in Syria, hundreds since the debate about chemical weapons began. For most Syrians the real issue is not how people were killed, it is death itself; the crowded graveyards, the inexorable tide of the homeless and the relentless destruction of the country and what they see as the indifference of the world to their plight.